Michael Eglin : Bio & Choral Music | Santa Barbara Music Publishing, Inc.
Michael Eglin (b. 1975 in Niagara Falls, NY) holds degrees in piano and composition from the State University of New York-Fredonia School of Music and from the University of California at Santa Barbara. 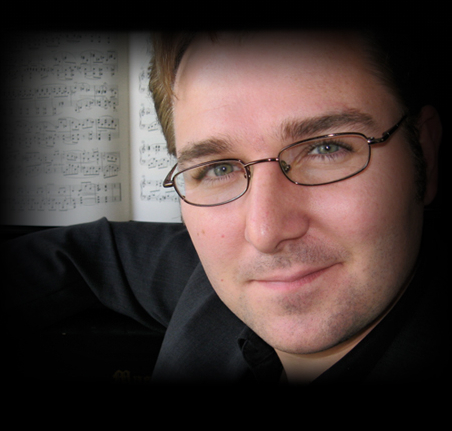 He has studied with composers Donald Bohlen, Joel Feigin, and Bill Kraft, and Early Music with Alejandro Planchart. Active as a conductor and singer as well as a composer, Eglin presently serves as Director of Music and Organist at El Montecito Presbyterian Church in Santa Barbara, CA as well as Artistic Director of the men’s vocal octet, Adelfos Ensemble. He resides in Santa Barbara with his wife and three children. Michael Eglin has 2 titles published with Santa Barbara.